Although California’s Central Valley can be dreary during winter, the migrant Sandhill Cranes have an entirely different view of it. To them it’s paradise; as it boasts abundant food, a temperate climate and a suitable habitat. It has everything a Sandhill Crane could want. That’s why every September they hit the Pacific Flyway in droves, and head south to their winter nirvana – to the marshes and wetlands near Lodi, California. And although they have specific habitat requirements, they’re easy to find if you know where to look. 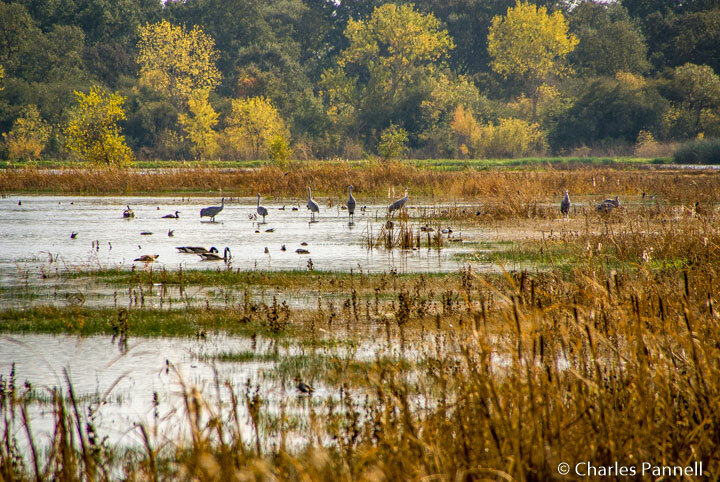 Located between San Francisco and Stockton, just off Interstate 5, the Consumnes River Nature Preserve (www.cosumnes.org) is an excellent place to spot the wintering cranes. It makes a great day trip from San Francisco or even a nice diversion on a longer road trip. If you’re traveling south on Interstate 5, take the Twin Cities exit, turn east and drive for a mile until you reach Franklin Boulevard. Turn south on Franklin Boulevard, drive 1.7 miles and look for the visitor center on your left. Northbound traffic should take the Walnut Grove -Thornton Road exit, turn east on Thornton Road and drive for about 2 miles. You’ll spot the visitor center on your right, just after you cross the Thornton-Franklin Bridge. There’s plenty of accessible parking at the newly refurbished visitor center, with ramped access to the front entrance. Inside you’ll find a number of interpretive exhibits, along with an information desk. 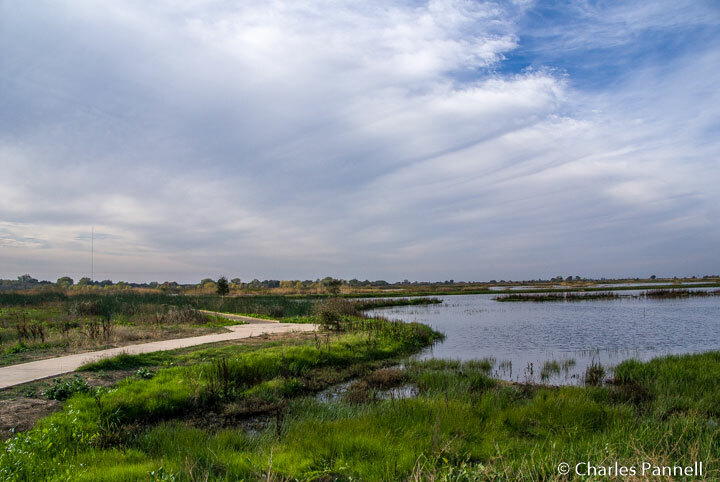 The building itself overlooks a wetlands area, and offers a great view of the preserve. Directly behind the visitor center, you’ll find the trailhead for the Lost Slough Trail. This one-mile loop is paved, level and very wheelable. There are several viewing areas along the way, with a few bridges and boardwalks that pass over the wetlands. Near the end of the loop, a half-mile boardwalk branches off to the right. It’s wide, level and nicely accessible, with a large viewing platform overlooking the marsh. 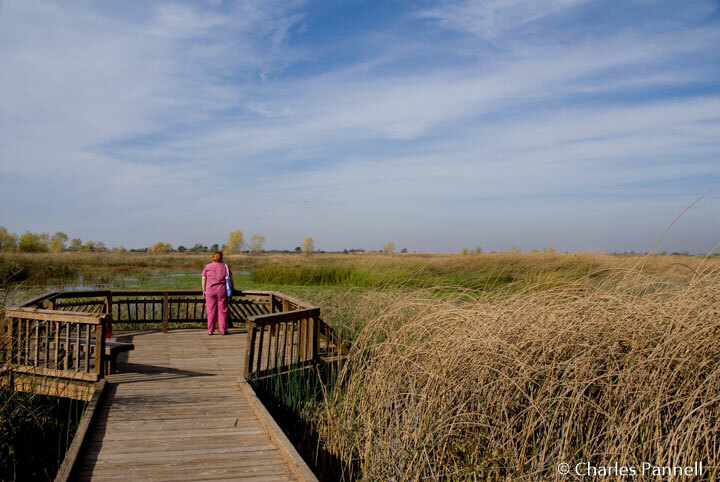 It’s an excellent place to spot Great Egrets, Northern Pintails, Red Winged Blackbirds, Turkey Vultures and — in season — Sandhill Cranes. There’s also a small parking lot by the boardwalk that has accessible spaces and an accessible pit toilet. It’s located just north of the Visitor Center on the opposite side of Franklin Boulevard. It should be noted that the rangers close the boardwalk at dusk, as it’s a favorite night roosting spot for the Sandhill Cranes. That said, the best time to visit this area is early evening, just before dusk, as it’s a beehive of activity then. Visitors are welcome to bring lawn chairs and just sit back and enjoy the show. Another good place to get a look at the Sandhill Cranes is at Woodbridge Ecological Reserve (www.wildlife.ca.gov/Lands/Places-to-Visit/Woodbridge-ER ), which is located just south of the Consumnes River Nature Preserve. To get there, follow Franklin Road south to Woodbridge Road, then turn east. The reserve is divided into two sites, across the street from each other. The South Unit is open to the public, and it features a short concrete ramp which leads up to a viewing mound. It’s a great vantage point to spot the cranes, but as with the Consumnes River Nature preserve, the peak viewing time is right before dusk. For the best daytime viewing, continue west on Woodbridge Road, and look for the cranes feeding in the surrounding farmland. The North Site of the reserve can only be seen on guided tours, which are held on Saturdays from October to February. Advance reservations are required for the two-hour tours, which begin 90 minutes before sunset. The tours begin at the South Site, where a docent gives a brief presentation. Afterwards, participants drive to the North Site in their own vehicles, to view the birds from an accessible shelter. Since there’s very little walking involved, it’s a great option for wheelers; however slow walkers may want to bring a camp chair, if standing for a few hours is problematic. Tour reservations can be made on the reserve website, so make plans now to see the Sandhill Cranes this winter. But don’t tarry, because they’ll be on their way back north come spring.